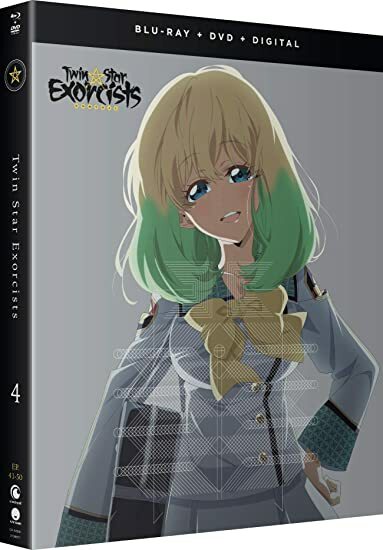 Twin Star Exorcists: Part Four - BUY THIS BLU-RAY! The battle between good and evil comes to its thrilling conclusion! What will become of the star-crossed lovers? Kuranashi's sinister plan leads to the decimation of the Twelve Guardians, and a familiar face from the past confronts Rokuro and Benio once again. The Twin Stars learn of their true nature when the origin of the exorcists is revealed, and it all ties back to one man who seeks to level the world at any cost—Abe no Seimei. While Rokuro is pushed to his ultimate deadly form, Benio is given her own ultimatum. Lose the one she loves, or leave him for a union with Seimei that would bring the end of existence. Disaster is about to strike, and the Twin Stars are humanity's last hope. Can they resonate one more time? THEN SEND IN A COMMENT ABOUT YOUR FAVORITE FUNIMATION TITLE (you may click on artwork above for a refresher) PLUS YOUR NAME AND ADDRESS TO contests@efilmcritic.com or WeLoveHBS@aol.com. (Just one e-mail please.) Put [b]"GET ME THE DOUBLEMINT OF EXORCISTS" in the subject line and cross your fingers. We will draw names and one of the prizes could be yours. Only 1 entry per household.